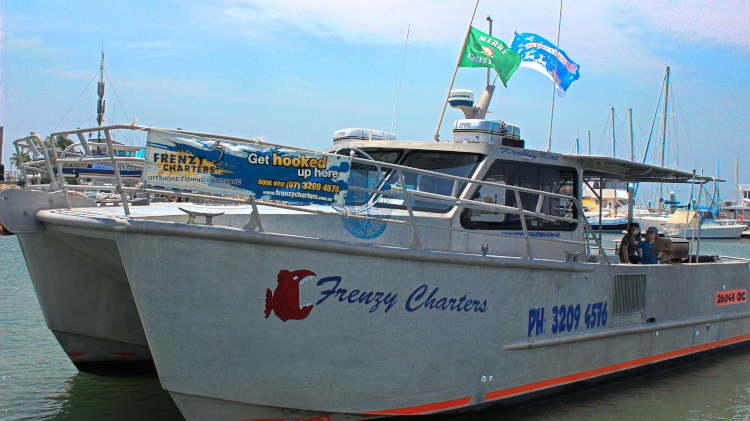 Krabbey Kat was built in Brisbane in 2004, custom made for the charter fishing industry. It boasts an overall length of 11.5m with a beam of 4.8m and is powered by twin 260hp diesel motors, top speed 22 knots with a comfortable cruising speed of 17 knots. Features include: full walk around deck, onboard toilets (male & female),shade canopy, hot & cold water, fridge, freezer, walk on boarding, plenty of dry storage is available onboard. It is loaded with the latest electronics. Radar, GPS, autopilot, fish finders, radios and stereo, are all in place to help put you on the action. On a typical day you may use a varity of fishing rod and reel combinations to capitalize on any and all fishing opportunities that may arise. The huge covered deck area and the stability this vessel offers will go a long way to make your fishing trip an enjoyable one. Gary and Noelle take a lot of pride in Krabbey Kat and you will enjoy fishing aboard one of the biggest and cleanest boats in Brisbane. Krabbey Kat is in commercial registration and fully insured for 12 passengers.